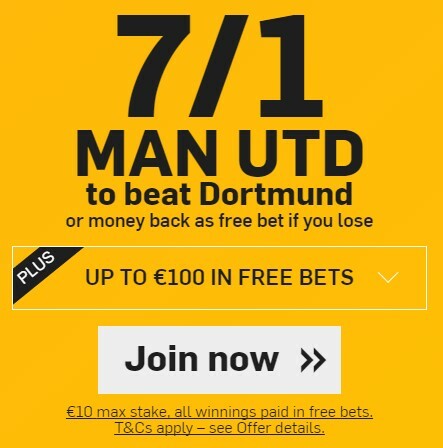 Betfair New Customer Offer: 7/1 Man Utd to beat Dortmund. Betfair is enhancing Manchester United to beat Dortmund tomorrow afternoon, friday 22th, in their International Champions Cup game in Shanghai. Manchester United will face Borussia Dortmund and Manchester City in China as part of the club’s Tour 2016. United will play in the International Champions Cup (ICC) against the Bundesliga side in the Shanghai Stadium on Friday 22 July, before facing rivals Manchester City in the iconic Beijing National Stadium on Monday 25 July, with both kick-off times to be announced in due course. This will be the second consecutive year that the ICC returns to China, as part of their worldwide tournaments through Relevent Sports, Catalyst Media Group and LeSports. Tickets for last summer’s ICC China, which was won by Real Madrid, sold out in just hours, with this summer’s ICC also expected to see unprecedented demand. Bet (max €10) on Man Utd to beat Dortmund in the ‘Match Odds’ market at the enhanced price. All winnings will be paid as free bets. Qualifying winning stake returned as cash. Exchange bets are excluded from this offer. Plus: you qualify for up to €100 in free bets. Pack of €20 free bet will be awarded with every 5 x €10 bets you make. See terms for an example. Offer is only open to new customers that sign up using promo code ZFBCIB. Without the code you can’t get the offer. Enhanced Prices: you will be credited your bonus winnings, paid as free bet tokens, usually within 24 hours after the event has settled.